Our range of products include kids cool party dress, kids party wear dress, kids dress, kids fancy dress, check stripe dress and boys party wear dress. 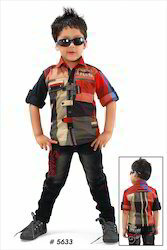 We are engaged in trader and exporter a wide range of Kids Cool Party Dress. These kids wear are available in different color combinations, patterns and designs as per the requirements of the clients. 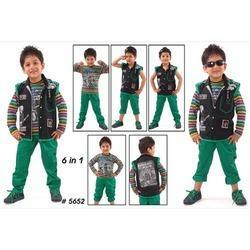 We provide cute and adorable Kids Suits that are printed with colorful characters and patterns which kids loved to wear. We bring forth an extensive array of Kids Party Wear Dress, which is the most favored item of the clients. Hence, we ensure that these provide extreme comfort to the users and prove to be skin friendly. In order to avoid any kind of skin allergies or rashes on the skin of young kids, we ensure that the vendors make use of soft fabric. 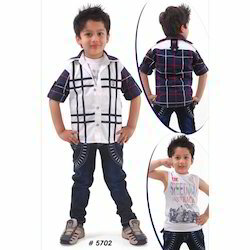 Offered by us is a fabulous range of Kids Dress that provides excellent comfort to the wearer. These shorts are sourced from the leading vendors of the industry, who make use of finest quality fabric in tailoring the array. Besides, our efficient tailors offer excellent options on these shorts in terms of their sizes and colors, suitable to the clients. 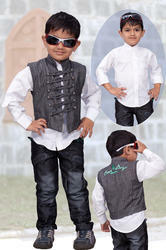 Our organization holds expertise in offering Kids Fancy Dress of the customers. This range is available in various patterns and shapes that provide astonishing looks to the wearer. These products are designed accordingly to provide enticing looks to the children. 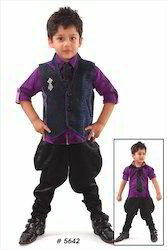 We offer a wide gamut of Boys Party Wear Dress made of high quality fabrics that are easy to maintain and wash. These Dresses are for the upper body usually having a front opening, collar, lapels, sleeves and pockets. We export these to our clients at comprehensive range. Looking for Kids Dresses ?